Win RBG: A legal leader and pop culture icon | SWITCH. At the age of 85, U.S. Supreme Court Associate Justice Ruth Bader Ginsburg has built an impressive legal legacy as a pioneer in gender equality. 'RBG' explores the inspiring and unique personal journey of this diminutive, quiet warrior's rise to the USA’s highest court – and her impact along the way – changing the rules, shaping the laws and becoming an unexpected pop-culture icon. The 'RBG' competition has now closed. Winners will be announced shortly. Competition opens at 5pm AEST on Sunday 15th July 2018 and closes at 11:59pm AEST on Sunday 22nd July 2018. Five winners will be chosen at random on Monday 23rd July 2018. To successfully win, entrants must fulfil the above entry conditions before the time the competition closes. Current members/followers are eligible to enter the competition. Only one entry per person. Only one winner per household. To be a valid winner, the entrant must not have won a prize from SWITCH within the last 28 days. Each winner will receive one double pass to 'RBG'. By entering, you agree to receive occasional emails from SWITCH in the future. If you decide to unsubscribe from these updates, any further entries will not be applicable. Only Australian residents are eligible to enter. 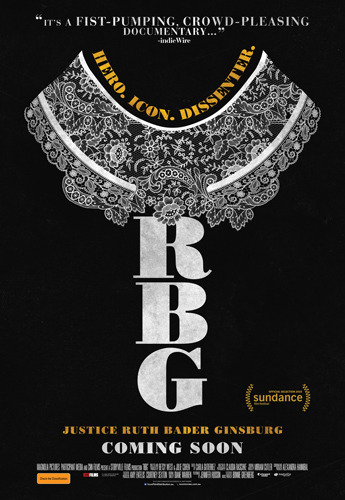 'RBG' is in cinemas from Thursday the 26th July 2018 through Icon.